Wow–I didn’t initially intend for this to be a two-parter, but I got to the end of #3 and figured it made more sense than continuing towards that 15-year-to-read post I mentioned. Ok, here we go again. And here’s Part 1 if you missed it. 5. As I mentioned before, I went back to primary last year, after 9 years with “big” kids. At first I was super scared. Ok, I was nervously excited. I knew it would all come back, but here’s perhaps the biggest way in which I know I am a better teacher a parent. I was not a mom the last time I taught 1st and 2nd grade, but now I have an 8 1/2 and a 5 YO. That definitely has added to my arsenal of strategies and tricks that I can use in countless situations. Remember how I mentioned that classroom management that first year was so hard to learn and how I thought I might die? Ok, I didn’t say that, but it’s funny to see the difference with managing things in a primary grade the second time around. Yes, part of the ease is that I have now been teaching for so many more years; this has been an education in itself. But being a mom has also given me another set of eyes in the back of my head. I know better what to anticipate (and then hopefully prevent) with 7-8 YOs, because I have one at home. I can speak to little ones in a better and more meaningful way since I’ve had so much more practice since the last time around. I can better predict what will be the right words to motivate, the right words to encourage, or stop or which words might send a little one into tears (and yes, I try to avoid those!). The extra treat that I didn’t anticipate was being able to understand the “culture” of this age; I totally understand their games, books, TV shows, etc., because they’re the same as what I have at home!! Ok, so back to the initial question. Do parents make better teachers? For me, that’s definitely true. However, there are many ways to define “better,” and there are of course AMAZING teachers who are not parents. I have, however, learned many lessons and can better understand many of the ins-and-outs since I am on both sides of the equation. That education has been such a gift. What I’ve known–and truly believed–all along though, is that regardless of their career, the job that parents do as their child’s first teachers is priceless. It is therefore not my job to replace them as the teacher, but to work together on a new team of teachers and parents to help mold our students into the best versions of themselves they can be. The work that mamas and daddies do before I even get their kiddos is so important to the work that I will then do with each student once they enter my classroom. 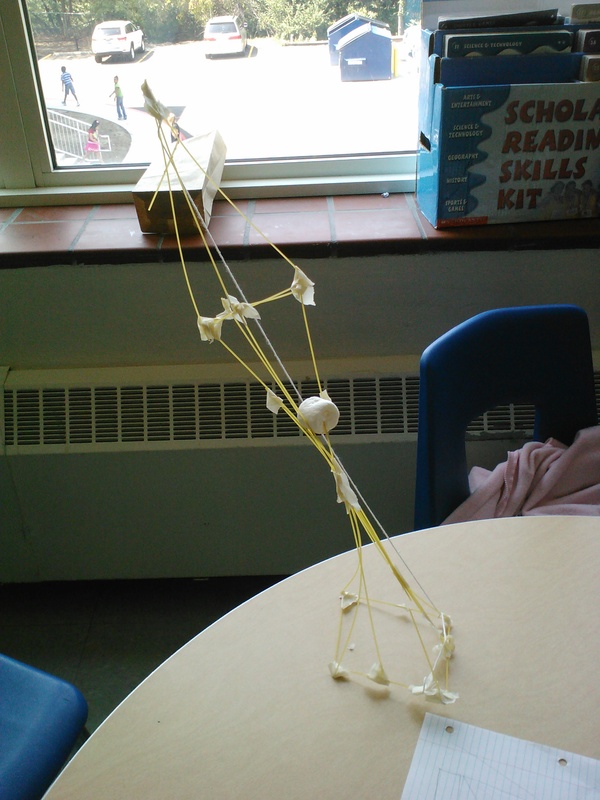 What fun to join the family of learners to work together towards a common goal! This post is part information, part reminder. I figured that since we’ve been talking so much about respect (or the lack thereof) in our classroom lately, I’d remind us of the Road Rules that govern the behavior expectations in our school. At Robinson, we have many “universals” that everyone everywhere knows and uses. One of them is an attention-getting signal. If an adult needs the attention of the kiddos they are working with–remember, anyone, anywhere: teacher, teaching assistant, principal, custodian, etc–they say “May I have your attention please?” while they hold up their hand and count backwards from 4 to 0. Why 4 to 0, you ask? Because that coordinates with another universal–our voice levels. Again, this is an “everyone, everywhere” kind of thing–these signs can be seen everywhere in our school from the cafeteria to classrooms and library to hallways. 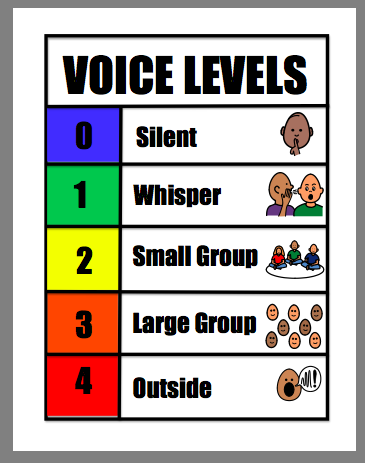 There are also signs around that designate which voice level should be used in each area. 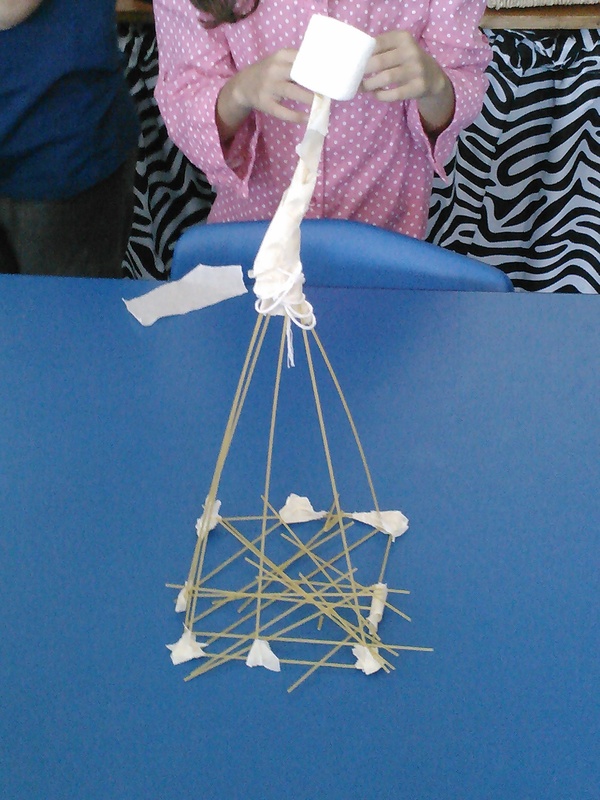 It really helps us all to be on the same page as far as expectations, and is really working. The hallway, for example, is a LEVEL 1 zone, and so the rule is “If you need to talk, you need to whisper.” This goes for everyone, even teachers. That’s really hard sometimes, for my kids and for me! What expectations do you have at your school? Have you tried building-wide universals? 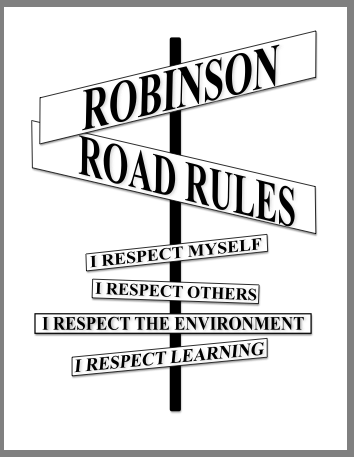 As a parent, what do you hear your kids saying about the Robinson Road Rules? I just started a book study, led by Mrs. Bell and Mrs. LeSeure, on the book Guided Math by Laney Sammons. I have only read the first few chapters so far, but am really loving it already. The book is based on the idea of using the strategies that kiddos already know as readers (visualizing, connecting, questioning, rereading, summarizing, etc) in relation to math; the same things that we do to understand what we read can help us understand math (or any other subject, for that matter!). 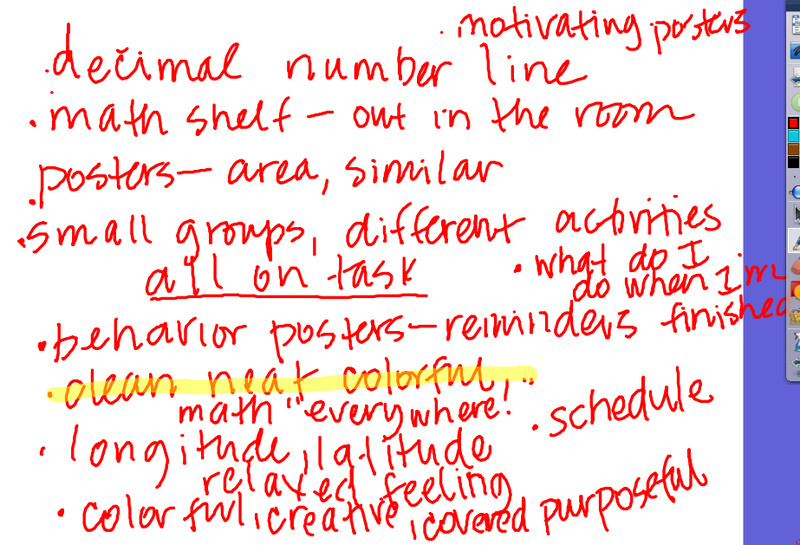 So, like I said, we’re just at the beginning, but have learned the overview of the big ideas in Guided Math. Then we were supposed to choose one that we were going to commit to change or add to our math class as we work through the book together. My goal was to add to the environment of numeracy in my classroom: to find new and innovative ways to add math to parts of our day outside of “math time.” The goal is to get kids thinking like mathematicians in all parts of their life at school. It wasn’t a ground-breaking question, nor is it the most deeply I’ll ever ask my kids to think, but it got us focused on math right from the beginning. I loved it when someone said they had no idea what to write and with just one question from a friend, were able to add “I used math when I had to figure out how long I had until I had to leave to go to my dad’s house” to the chart. That’s what it’s all about really, supporting each other in our learning. 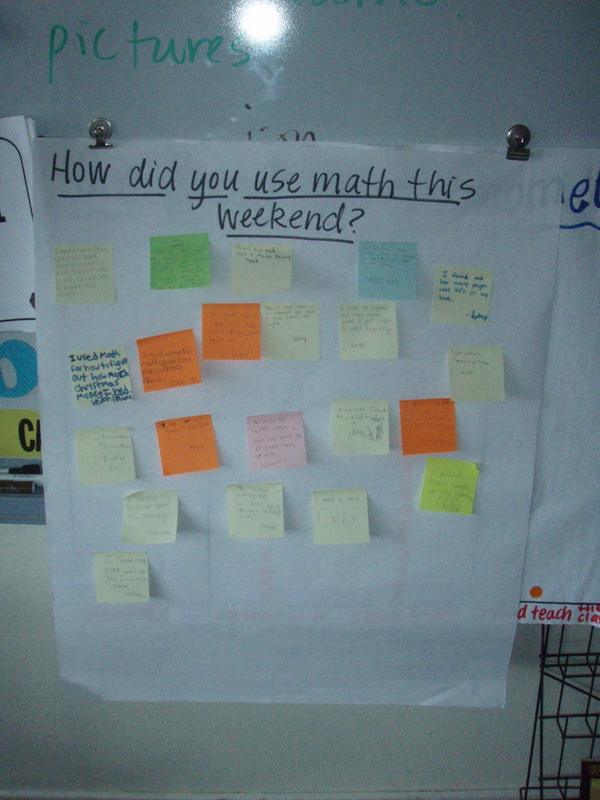 So what math did you use this weekend? 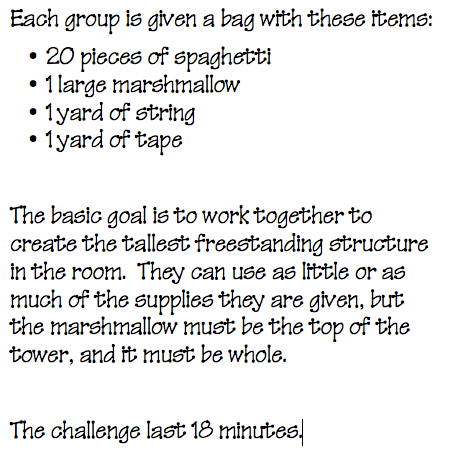 How do you involve your kids in mathematical thinking outside of “math time?” What suggestions do you have for math questions we can use for a warm-up? We’ve love to hear your thinking and add to ours! My kids are used to what I call “geometry challenges”, where they have to prove that a statement is true, by using what they know as mathematicians. 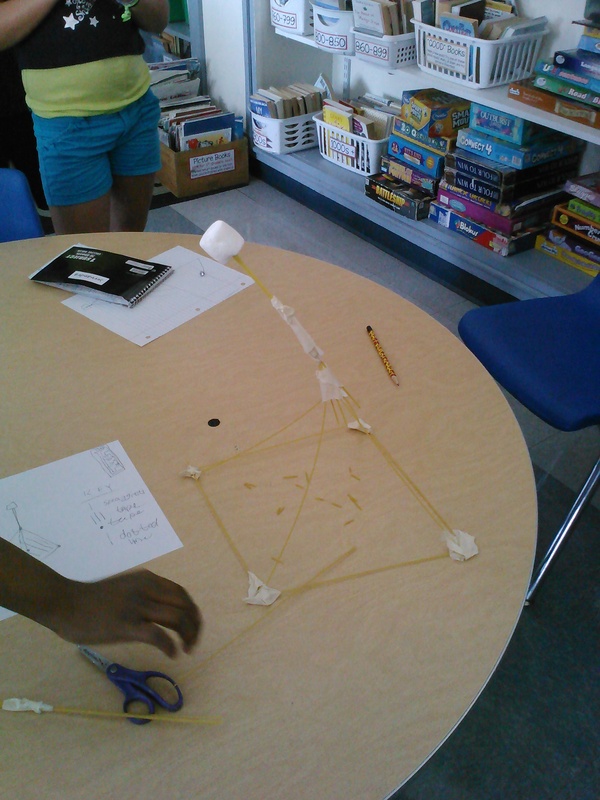 The first one we did was to prove that the shortest distance between two points is a straight line. They worked alone or with a partner to show how that was true, or to find a way to prove that it wasn’t. 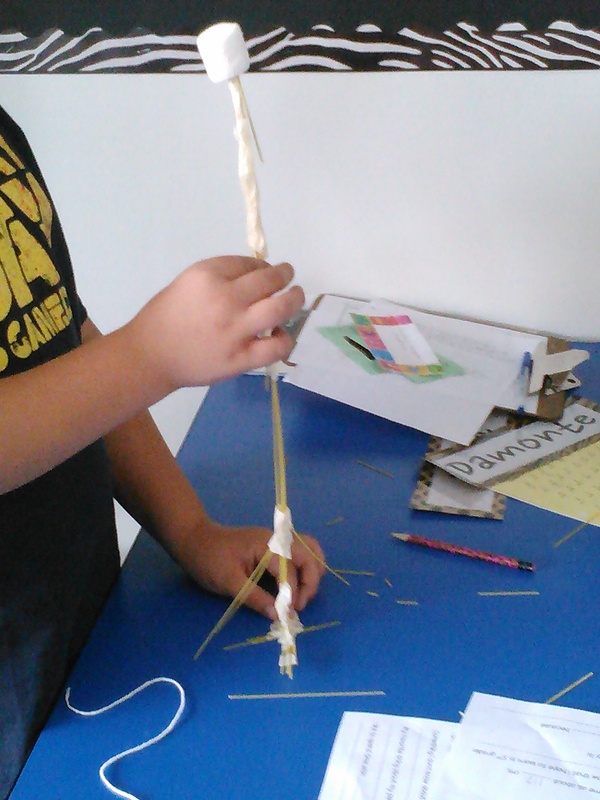 Then next one was to prove that a straight angle equals 180 degrees. 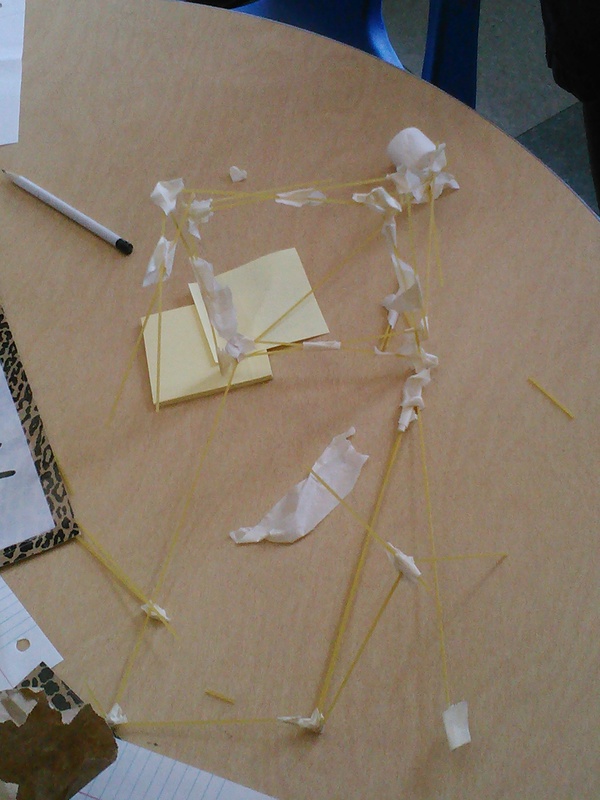 With that one, they used Power Polygons with angles that they know to show whether that statement was true or untrue. Needless to say, they’ve totally rocked each of those situations, and really shown what they know about geometry. Like in the past, they had amazing things to show for the work on this challenge. Before I show you what they did, I’m curious to know what your answer would be. 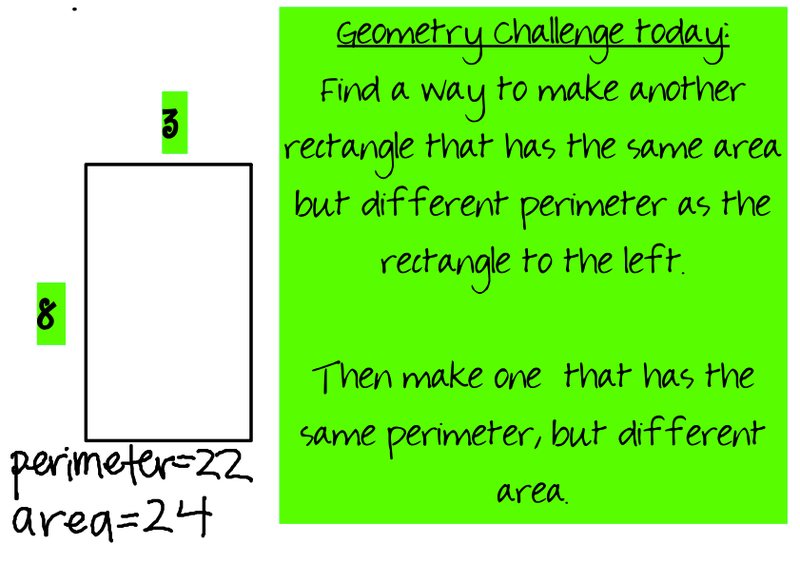 Could you answer this challenge?